The Coal House at Woodberry Wetlands is an approved venue for non-religious marriage and partnership ceremonies registered with Hackney Council. 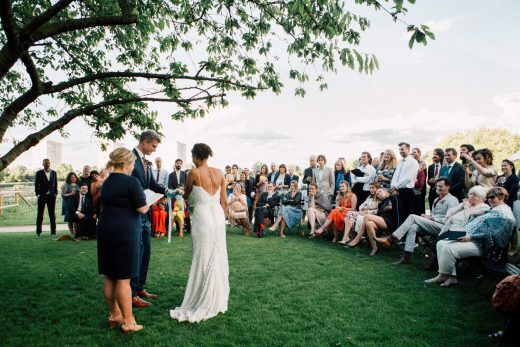 Just 10 minutes by tube from Kings Cross, the historic Grade II listed Coal House at Woodberry Wetlands makes an idyllic wedding venue with its waterside view over 11 hectares of sweeping reeds, wildflower meadow and woodland wildlife habitat. This intimate venue may be configured to seat up to 80 persons and dressed with glowing candles, scented flowers and other personal touches for the perfect romantic atmosphere for your special day. The spectacular backdrop and tranquil setting across the terrace, garden and New River clearing additionally provide ample space for private seasonal outdoor blessings and celebrations whilst you make your special vows. Afterwards wedding guests can freely enjoy a stroll across the 11 hectare nature reserve. The fully licensed Coal House Café also serves as an excellent base for receptions year round and a variety of external structures may be commissioned to your bespoke design to enhance the venue and accommodate up to 150 guests for your wedding breakfast. We can also offer inclusive packages, priced per head, that include venue hire, marquee hire, equipment hire and drinks. Click here more information about booking the Coal House at Woodberry Wetlands.